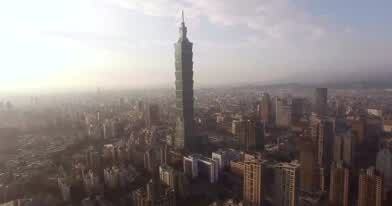 In this short but mesmerizing drone video, you'll get a drone's eye view of the Tapei 101 Center in Taiwan. When the 508 meter (about 1.6k ft.) office tower was completed in the Taiwanese capital city in 2004, the 101 story tower displaced the Petronas Towers in Kuala Lampur to become the world's tallest building. It was surpassed by Dubai's Burj Khalifa in 2010 and is now down to #10 as of 2018 but it's still an amazing structure. See it here in this short clip by Dazdjpt.